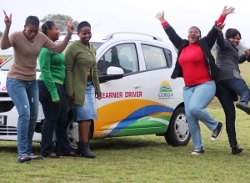 July 2012 marked a great milestone for WSU student development programmes when the Coega Development Cooperation sponsored WSU NMD with four driving simulators and a car to teach students driving skills. The Coega Development Cooperation had promised to add more simulators and cars once the project was underway and proving to be successful. April 2013 marks yet another milestone in this endeavour as Coega will be coming back to WSU to deliver a second car for the program due to its unprecedented success. This comes after 59 WSU students from the Mthatha Campus where the project is based have successfully passed their learner’s licences as well as driver’s licenses after completing the WSU simulator and driving program. This opportunity has been giving the local learner driver the ability to acquire basic driving skills in a safe, yet realistic environment then head out onto the roads. The simulators boast real vehicle parts including a right hand driver’s unit, seat belt, earphones, steering wheel, indicator, windscreen wiper controls and a five-speed manual gearbox, giving learner drivers a very realistic experience. The clutch for example is not a spring or a hydraulic system, but a real clutch plate and there is also a 32″ LCD display incorporating the rear view mirror views. According to Alf Settle, Coega Training Manager, driving skills are essential in today’s job market hence it is imperative to help graduates with this necessary skill. “When we saw how well the students and community had taken to the simulator and driving programmes we decided to keep our promise and look at sending in reinforcements because the project has been such a huge success,” said Settle. Settle added that the aim is not only to teach learners and other potential drivers to pass their driver’s license test, but to contribute towards improved quality of driving in South Africa by establishing the correct driving skills under all possible scenarios. Noluvuyo Nqebelele, Mthatha Campus Director, continues to invite interested students to participate in this great opportunity and is hopeful that Coega will continue to see the success of the program and roll it out to other WSU campuses. “We take Mthatha as a case study and the success shown by our students in their interest and dedication towards the program has been excellent. It now leaves us hoping that Coega will see how much we value the skills building and enhancement opportunity they have afforded us and in turn bless other WSU campuses across the Eastern Cape,” said Nqebele. The simulator and driving training is based on the K53 driver test standards. There are 12 modules learners can follow, including practicing changing gears, clutch control, incline starts, parallel parking, driving in city traffic, as well as driving at night or in bad weather conditions – the likes of rain and even snow. “All students interested in learning through the simulators need to be registered students who already have learner’s licenses and will practice a full duration of 10 hours,” added Settle.